A huge HELLO to all our visitors! Emma is the founder of a support group in Newcastle upon Tyne - see http://www.ne1dizzy.org.uk Lots of visitors ask about the Neurotologist we saw. Details are: Dr C Agrup/Prof Linda Luxon, Neurology B (Hearing and Balance), Neurotology, 4th Floor, Queen Mary Wing, The National Hospital of Neurology and Neurosurgery, Queens Sq, London. We know of a Neurotology department at Leicester Royal Infirmary too but are unaware of any others in the UK. The fact that you have arrived at this site implies either you or someone you know has had or still has the inner ear infection Labyrinthitis. The norm for Labyrinthitis is to last between 3 and 8 weeks and then disappear without so much of a trace. For a fair number however this does not happen and long after the doctor has said "You'll be fine in a few weeks" such people have noticed no improvement, let alone a recovery. This website is for those people who have been suffering for months and years rather than weeks. 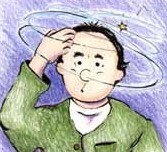 The website will explain this syndrome of "Uncompensated Labyrinthitis" whereby the brain or CNS has not yet compensated for the inner ear injury. We are two UK sufferers who have been inspired to form this site in an attempt to inform and help others out there who are going through the same experience. Our aim is to make the difficult, emotional and pretty devastating "Labyrinthitis journey" which we have experienced, that little bit easier. As we have realised, vestibular disorders are so often misunderstood by the general public as well as health professionals and we feel the need to raise this understanding and awareness of such a disabling condition. If we are able to inform and support a handful of people, then in our eyes this website is a job well done. Please click on the links to the left of each page to navigate yourselves around our site. NB: Please note we are not health professionals so our information is explained in our own way. As part of our mental journey in dealing with this disorder, we have both read a lot on the subject but we are not "experts". The site is more of a "patient's perspective".